Fourteen years ago, she was performing a solo act in hotels. 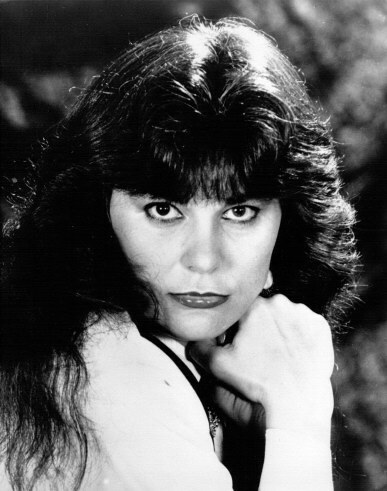 In May, Dawn Maracle was named the 1989 Female Vocalist of the Year by the Country Music Associations of America. For the country-western singer, born in Malone and now living in Southern California, it has been a steady rise to the top - if not a bit of a shock. In September 1988, the California Country Music Association nominated Miss Maracle as regional female vocalist of the year. "I thought, "How could they nominate me - I was only on the music scene (in Southern California) three months?' "
She beat the association's other nominees to win the regional competition, and then she competed for the state title in November and won, "which was even more of a shock. I was nine days away from having my son and I was as huge as a house. I was up on stage thinking, "Who's going to vote for me?' When they announced my name I couldn't move for a minute." In May, at the Country Music Associations of America's Second Annual American Eagle Show, held in San Dimas, Calif., talent from 42 states was represented and Miss Maracle was, gratefully, "back to my figure." At this final level, the field was pared down to Miss Maracle and four other singers, said Ralph T. Hicks, the organization's executive director. "When I won, it was almost anticlimactic," said Miss Maracle. "I wondered, "What comes after this? And what will this do in terms of my career?' I guess I'm still waiting to find out." She was born Dawn Michaud on June 1, 1955, in Malone, and lived in Potsdam until 1965, when her family moved to Syracuse. There she attended junior and senior high schools. Later, the family settled in Auburn, where they still make their home. Miss Maracle said she was raised on country music, listening to the greats: Hank Williams Sr., Brenda Lee, Patsy Cline and the Everly Brothers. Between 1975 and 1985, she played bass and a little lead guitar, and sang in her band, 75 RPM. She also appeared on radio, television and stage across New York State, Pennsylvania, Florida, Arizona, California, Alaska, Canada and in Osaka, Japan. But the early days - performing in Sheratons, Holiday Inns and Hiltons - were good ones, Miss Maracle said. "I remember them as great days. I got to live in the lap of luxury. I didn't have anybody else to worry about except myself, and my schedule was very flexible. Also, the money was great." She was earning between $500 and $600 a week. But she decided to move from her home base in Auburn in December 1985. "I never much cared for the weather. It always depressed me. "Besides," she said, "I was at the top - hitting the ceiling - but there was nowhere to go. I was achieving the goals I went after and people seemed to like my music. But I wanted more than that." She headed west - to California - with her boyfriend and her two daughters, arriving in the Golden State on New Year's Eve. Though the relationship ended, Miss Maracle decided to stay on the west coast because "California was an open door for country-western singers." In November 1987, her divorce from Russell N. Maracle was finalized, and her daughters, Tiffany V. Maracle, 9, and Haley B. Chitambar, 5, were touring with her. Shortly after her divorce, she married David L. Long, and had his son, Jared J. Long, now 9 months old. Around the time of her divorce, Miss Maracle was singing with a three-piece rock band and decided to become more proficient on lead guitar. "When I was doing the solo act I could occasionally do lead, but I really needed a band behind me. So I went to jam sessions and took my guitar with me," she said. She now has a band, The Dawn Maracle Band, which features steel player Blackie Taylor, drummer Jerry Ranney, bassist Jimmy Lynn and Chet Atkins-style guitarist Christopher Landry. "They're absolutely great guys - and so supportive of me," Miss Maracle said. 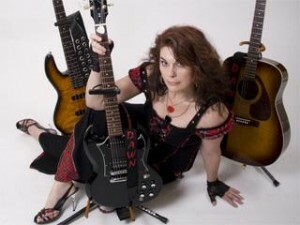 Nancy Rose, an "impeccable vocalist who can pick up harmonies very quickly," was recently added as a backup singer, she said. "If they're not playing your songs right, it won't work and your breathing and singing will be off. But this band is super and their tempo is always right on," she said. Miss Maracle performs original songs. She said most of them are written very quickly - some take no longer than 15 minutes to compose. Most, however, are written in about two hours. Her songs range in theme from people down on their luck and entangled in sad situations to lighthearted, humorous tales. "I Just Want A Telephone" (1985) is about a young man involved in a troubled relationship. He enters a bar trying to find a telephone in hopes of talking to his girlfriend. He meets with a variety of mishaps only to discover in the end that the pages have been ripped out of the phone book. "Jailhouse Bound" (1987) is about a man who has landed in jail, yet he doesn't really understand the circumstances that put him there. A lighter song, "Hardly Working" (1988), is about a person who works hard for hardly any money. But he fantasizes a dramatic change of events, in which his fortunes reverse and he acquires a mansion and limousine and all the other luxuries money can buy. "She's equal, if not better, to the talent coming out of Nashville," Mr. Hicks said of Miss Maracle. "She's very, very talented and I'm sure she'll win many more awards and keep climbing the ladder." Miss Maracle wants to keep climbing. An album of original songs is "hanging in the balance," and a play based on the life of Patsy Cline, in which Miss Maracle would play the lead, is in the works. America's 1989 Female Vocalist of the Year. Photo providedDawn Maracle returns to Auburn Aug. 1 for a benefit performance, the start of an upstate tour. but she took with her important lessons as she continued her career in music. Maracle began performing in the band “75RPM” in 1975 as a bassist and vocalist. upstate New York. She is returning to Auburn on Aug. 1, headlining a benefit for a 16-year-old cancer patient. about the area. “Up in Auburn, everyone is close-knit. It isn't cliquish, its like everyone is a big extended family,” Maracle said. offered to me personally.” This show isn't the last Auburn will see of Dawn Maracle, she assures. “I love the people up here, and so many people I played with are still around. Dawn Maracle injects her alternative stylings with a spark of energy and a way of bending melody that stamps her distinct signature on her tunes. Catchy without sacrificing artistic credibility and shot through with songwriting savvy that speaks of innate talent and a dedication to the perfection of one's craft, Maracle's songs are road signs along the path to musical satisfaction. "Music makes me feel invigorated and full of energy," says Maracle, and it's plain to see – or hear – from the way her music shines along a sharp edge of finely honed sounds. Her music is full of the energy with which music itself inspires her, as though it was a gift that demanded to be passed on. Her music is as absorbing for fans as it is for her as the creator. "I get deeply engrossed with passion when performing any music,” she declares, and it's a passion that qualifies as benevolent contagion without cure – and who would want a cure? For Maracle, though, the credit doesn't rest with her. She views herself as a messenger of sorts. Music is a present with which she was bequeathed and her duty as an artist is to shape it into pleasing sounds and share it with others. And such she does gladly. "Music is a gift from God and if you are blessed with a talent, you should be honest and respect that." Maracle hit the ground running with her talent. She's devoted to her music and writes and plays with an unquenchable enthusiasm. "Take it as far as you can and never take it for granted." Maracle has proven her worth as a musician many times over. She's been awarded the National Female Vocalist of the Year Award two different times from the CMAA, which also declared her tune “Hardly Working” the song of the year in 1990. She has also been declared one of the Phenomenal Women of the Web. A slew of nominations have also graced her career, including nods for guitar, keyboard, bass, songwriting, drumming, fiddle and more. She's in the Who's Who of American Women, Biltmore’s Who’s Who as well as the Who's Who Historical Society. Artists with whom she has shared the stage include T. Grahm Brown and The Coasters. Maracle is busy playing, working on children's programming voiceovers, writing and recording. The summer of 2008 will see the release of a new CD. She's working with A&R Select, the world's leading artist development firm, based out of Los Angeles, CA.